I was sweeping out my aviary one day when I found a shriveled foot on the ground. I looked above at my Brotogeris first...nothing. Next I turned to my button quail. Blackavar was walking like a lowrider so I caught him up and checked. Sure enough, he was missing his foot at the ankle. The stub had healed up fine by itself and he had been walking on it so fine that I hadn'deven noticed a limp. My tiels had just fledged four chicks when one of them broke it's wing. I have no idea how it managed to do that- they were in a rabbit hutch with no room for flying into objects or falling to the ground. Perhaps it was a night fright. In any case, the vet wrapped the wing. The bones healed but were fused at the joint. The wing could no longer be extended. This was also in the days before I handfed chicks under any circumstances and my tiels had picked the clutch. This chick in particular had a very bald head and with the broken wing and bobbing baby walk it looked just like a hunchback. Hence, Igor. Igor was given away to a woman my stepfather knew at work. 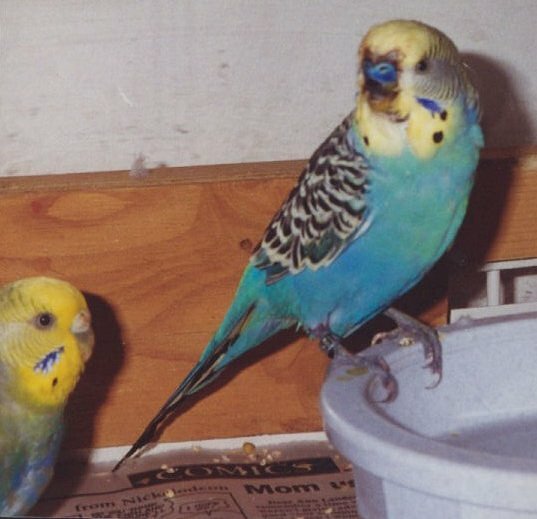 For years I cage bred budgies. When I added a second aviary I tossed in all my budgies and tiels. Maggie couldn't seem to fly and whenever she got scared she plummeted to the ground. I still don't understand why she is unable to fly. That year during breeding she beat up her keel pretty badly so there was a huge scab covering the brooding area. I had to foster the eggs under another hen and move Maggie and her mate out of the flight and into my "baby" cage (intended for chicks awaiting sale). It was right next to the budgie flight so everyone could still see and hear each other. Chipper's disability is quite recent and it was my fault. I was moving my budgies and kaks up to northern CA. The day before the drive they were in my vacant aviary in southern CA. That day one of my birds turned up with two blood spots on either side of the tail- evidence of an attack. Visions of a weasel or some other creature sneaking into the flight and killing all my birds flashed through my mind. I debated on whether or not to bring the birds indoors but decided to leave them out. I'd always kept my pet birds in this flight whenever I was down with no trouble and I knew these guys would hate being in carrier cages all night. In the morning Chipper, my alpha male, was missing his upper mandible. On the drive up he didn't look so hot so when I got in I called the vet and scheduled an appointment for the next morning. Chipper had to be left at the vet's for tube feeding, pain killers and antibiotics. A hundred and ten dollars later they got him rehydrated and boosted his energy. I got him back the next morning with instructions to keep up the tube feeding (luckily I'm a breeder and know how to tube feed), beak cleaning and medication. Chipper seemed stablized the next day but then started having convulsions the following evening. He kept leaning toward the right and going around in circles. This happened every five minutes or so and then stopped. Then came one that didn't stop- it went on all night. The vet's office was closed so there wasn't anything I could do. I expected to see a dead bird the next morning. Instead I found a very weak Chipper (probably too weak to even convulse). I did my best to load him up with calories during the tube feedings. He was running out of energy. Later that day it started again. This time he would flap uncontrollably for 30 seconds or so and then stop. He was surviving so well despite all this that I thought he might make it. He died that night though. I was actually relieved- his suffering was over.